Need a home inspection in Seattle? 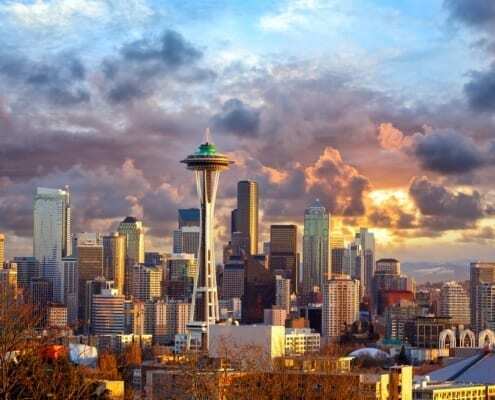 Seattle, Washington is located on the coast of the Puget Sound, and is one of the fastest-growing major cities in the United States. It’s noted for having a great quality of life, ample recreation opportunities, and an affluent population, and it’s the northernmost large city in all of the United States. The city was first officially incorporated in the mid-19th century, and was at the center of the Gold Rush, and also became an important shipbuilding town. After the Great Depression and the Second World War, Seattle began to boom. Today, a total of around 730,000 people live within the city itself, but the combined population of the metropolitan area exceeds 4.3 million, which makes it the 13th most populous region in North America. Seattle has a very strong economy, due in part to the number of major corporations headquartered in the city. It has the 11th largest metropolitan economy in the US, worth $231 billion in 2010. Six Fortune 500 companies are headquartered in the city, including Alaska Airlines, Amazon.com, Nordstrom, Starbucks, and Weyerhaeuser, as well as Expeditors International. A few other Fortune 500 companies headquartered in the metropolitan region include Paccar Expedia, Costco, and Microsoft. Seattle has a great public transit system, including a Streetcar System, and a number of bus lines, including Sound Transit, the King County Metro, and the Downtown Circulator Bus. Link Light Rail, Sounders, and Amtrak provide passenger rail service to the city. In addition, several ferries provide passenger services to nearby island towns. Commuting by car is also common. Schooling is provided by Seattle Public Schools, which serves more than 47,000 students in the area. Numerous private and charter schools are also in the area. For post-secondary education, Seattle is home to the University of Washington, Seattle Pacific University, The Art Institute of Seattle, and many other colleges, both public and private. Seattle is a beautiful city with a lot to offer. If you want to learn more about economic opportunities, the housing market, schools, or anything else before you plan to move to the city, we’ve put together a number of helpful links which can help you do just that. Ready to move to Seattle? Need a home inspector to help you choose the right home? Whether you’re moving from elsewhere in Washington or from out-of-state, Key Inspection Services is here to help. If you’re interested in our services, please contact us right away, or feel free to schedule your home inspection online now.